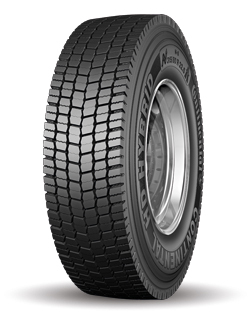 The Continental HD Hybrid truck tyre is a Goods and People Motorway Drive tyre. Flexible suitability for the combined service in motorway- and distribution -traffic. Well-balanced fuel consumption to mileage ratio thanks to optimized interplay of tread-stiffness and -geometry. Very good traction in all weather conditions thanks to balanced lateral groove to sipe ratio. Enduring traction over life time due to well-elaborated transition of groove- and superstructure.